Tehillim, with the Metzudot commentary. Józefów, 1842. 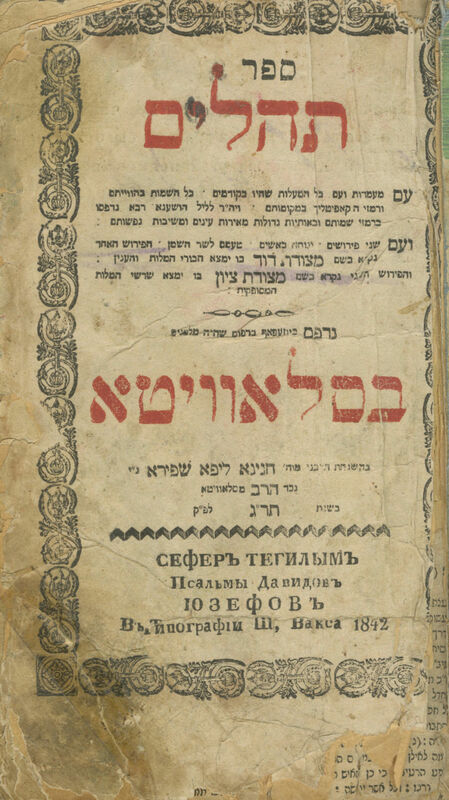 The title page states: "Printed in Józefów in the printing press which was previously in Slavita, under the supervision of R. Chanina Lipa Shapira, grandson of the rabbi of Slavita". The word "In Slavita" is emphasized with enlarged letters and red ink. The printing press in Józefów was the first stage in the reestablishment of the printing press by members of the Shapira family, in place of the Slavita printing press, which was closed by government order in 1836. Only a few titles were printed in this short period (1842-1844) in Józefów, before the printers relocated to Zhitomir, where they set up their printing press, which would operate there between 1847-1867. Signature on the title page of Maamadot: "Yaakov Moshe, official Shochet and Bodek". , 144, 32 leaves. Separate title page for the Maamadot. 18.5 cm. Fair-poor condition. Many stains, dampstains and signs of use. Large tears to title page, affecting border. Title page mounted on paper for preservation (concealing the censor's authorization and printed ornament on verso). Tears to leaf following title page, affecting text, repaired with paper. Extensive wear and tears to other leaves, affecting text. Detached gatherings. Without binding.